It’s the most wonderful time of the year, right? Exactly. One of my favorite aspects of the Christmas season is the music. Growing up, I recall the local radio station playing Christmas music solely on Christmas Eve and Christmas Day. That meant that we had to get out our little boom box and cassette tapes and record as much of it as possible. This served as “seed” music for the following Christmas. And boy did we wear those cassette tapes out! Today, it’s a different story. Often times I hear Christmas music playing way before Thanksgiving…and I’m not the DJ orchestrating this holiday magic! In shopping centers, restaurants, and even on the radio, the Christmas tunes are cranked up loud and proud early in the season. I don’t mind really…and then again, maybe I do. Who doesn’t love “White Christmas?” I mean, I absolutely adore it! It’s the best-selling Christmas song of all time! But this year, whenever I hear it a sadness ensues. It’s like I’m hearing this familiar tune with new ears. I remember the song from childhood, fell in love with it AND Bing Crosby while watching the old black & white version of Holiday Inn…and the song was further impressed upon my heart when I discovered the movie of the same title a few years later. Bing sings the song so effortlessly. As I write this I can picture him at his piano…the debonair crooner drawing us in with this perfect song. His voice so melodic and rich…all the casual sophistication of an American icon just pouring out of every single note. Did I mention that I adore this song? One can only imagine how surprised I was to find that this song, this tried and true favorite could cause me such grief. It was like walking into a door…and I never saw it coming! Turns out that I shouldn’t be surprised at all with the heartbreaking aspect of “White Christmas.” It’s nostalgic. Wistful. There’s a sense of longing…and hope. A wartime favorite, “White Christmas” was the song American soldiers clung to following the attack on Pearl Harbor. It was a staple on Armed Forces Radio as soldiers tuned in while stationed overseas during World War II. For many, on the war front and at home, the lyrics told of bygone days and easier times…a reminder of a “normal” that they hoped to reclaim. For the songwriter, Irving Berlin, the lyrics were much deeper as many believe he wrote the song during a bout of extreme homesickness. Still, other music historians claim the song was actually written to memorialize Berlin’s infant son who is said to have died on Christmas Day. Given this history, the song certainly takes on a different significance and gains a depth that I wasn’t aware of before. 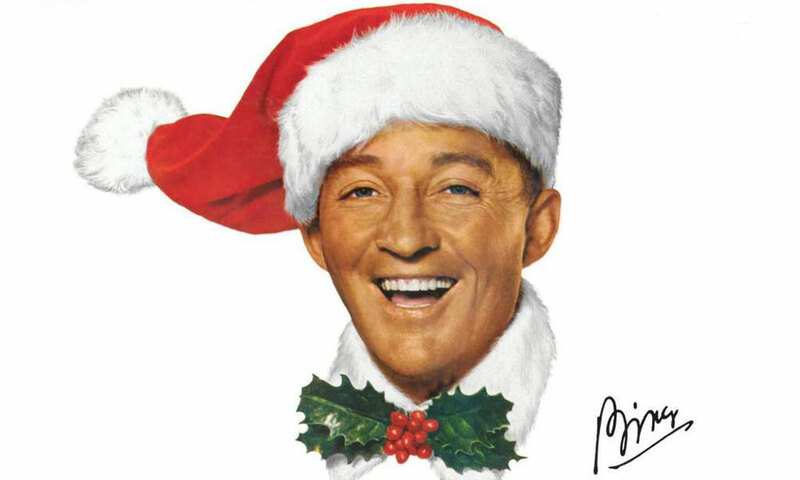 For these reasons (and so many more) Bing Crosby is slowly killing me…at least he is this Christmas. And while at first this slow, figurative death was limited to “White Christmas” it has moved far beyond. Now, it’s EVERY Bing Crosby Christmas song…and there’s no way to avoid it. I immediately recognize his voice and something just gets caught in my throat. My heart sinks a little. My eyes get damp in the corners. I can’t explain it. I’ve been jokingly (and seriously) blaming everything on hormones lately, but really I know it’s something more. It’s me. It’s today. It’s nostalgia. It’s dreaming. It’s gratitude. It’s a brokenness. It’s hope. It’s this present time and place. It’s perfect and imperfect all at the same time. It’s Christmas…just listen. Okay, so I’m not really a member of the official Santa Claus family, but Christmas is my FAVORITE time of the year! I am well versed in all the songs of the season, know the “Code of Elves” verbatim and I’ve successfully completed several Christmas-themed Buzzfeed quizzes. So OBVIOUSLY I’m practically an adopted member of the Claus household 🙂 and as a self-appointed Christmas authority I feel obligated to share these 12 little goodies with the planet to ensure you and yours experience your best Christmas yet! 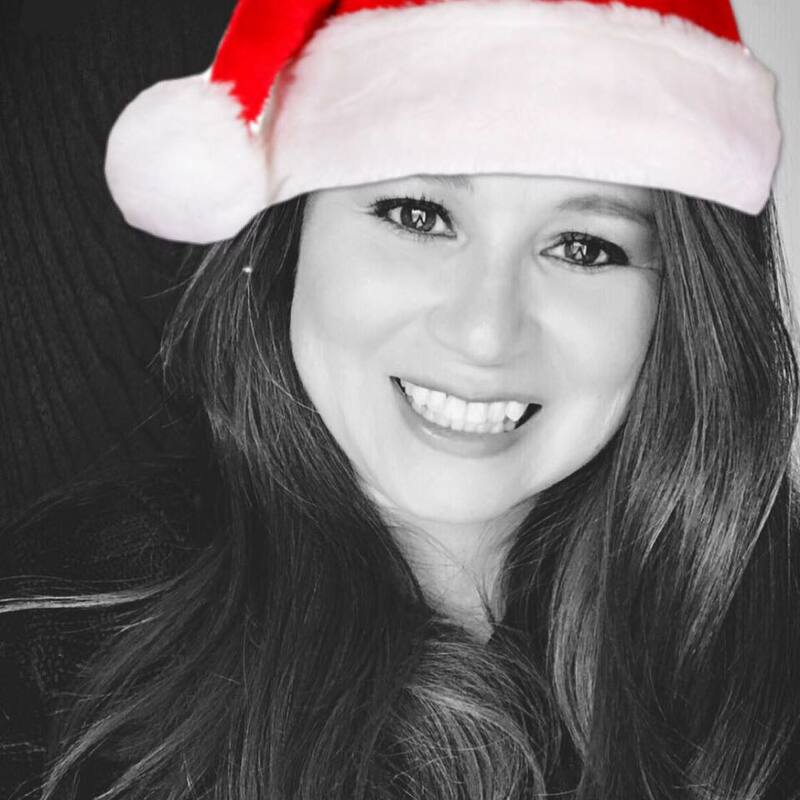 In no particular order, I present to you Anna Claus Holiday Must Haves…. Holidays on Ice by David Sedaris. I read this collection of short, satirical (and politically incorrect) stories every December for many, many reasons. Mostly because who doesn’t love the escapades of a grown man parading around Macy’s as an Elf, the unlikeliest Christmas Eve houseguest EVER and the snarkiest review of children’s Christmas pageants you’ll ever read? Nothing gets me in the holiday mood quite like this fun (and funny) book. Complete brain candy, it is good for continuous laughs. Ella Wishes You a Swinging Christmas If you love jazzy, upbeat Christmas music this album is for you! The 60s style jazz offerings are traditional yet they possess that special “zing.” CAUTION: The “cool cat” vibe this album induces may cause scatting! Wonderful background music for doing just about anything holiday related. Candy Canes Nothing says Christmas like candy canes. Sweet and pepperminty I try to consume as many as possible. Between Thanksgiving and New Year’s it’s not unusual to find these tasty treats (and their tiny crumbs) in my purse, in my pockets or in my mouth! Pandora’s Swingin’ Christmas Radio Station This is the ONLY internet radio station I listen to during the holidays. On the computer and on my phone this is my go-to background music for the holiday season. Here you’ll find everything from the Rat Pack Christmas album and Louis Armstrong offerings to Michael Buble and everyone in between. Santa Hat (Reindeer Antlers optional) My all time hat of choice, the Santa hat comes out right after Thanksgiving and lives among the coats all Christmas season long. This year I’ve decided to add reindeer antlers to the list of approved December head-gear. Very festive! Starbucks Christmas Blend and Peet’s Holiday Blend Warm, sweet and spicy…this is what Christmas tastes like! For a coffee lover like myself this is a terrific blend that gets the day going…also serves as the perfect addition to an evening dessert. Would I like another cup? Of course! Nativity Nativities set the scene for a Christ-centered holiday. 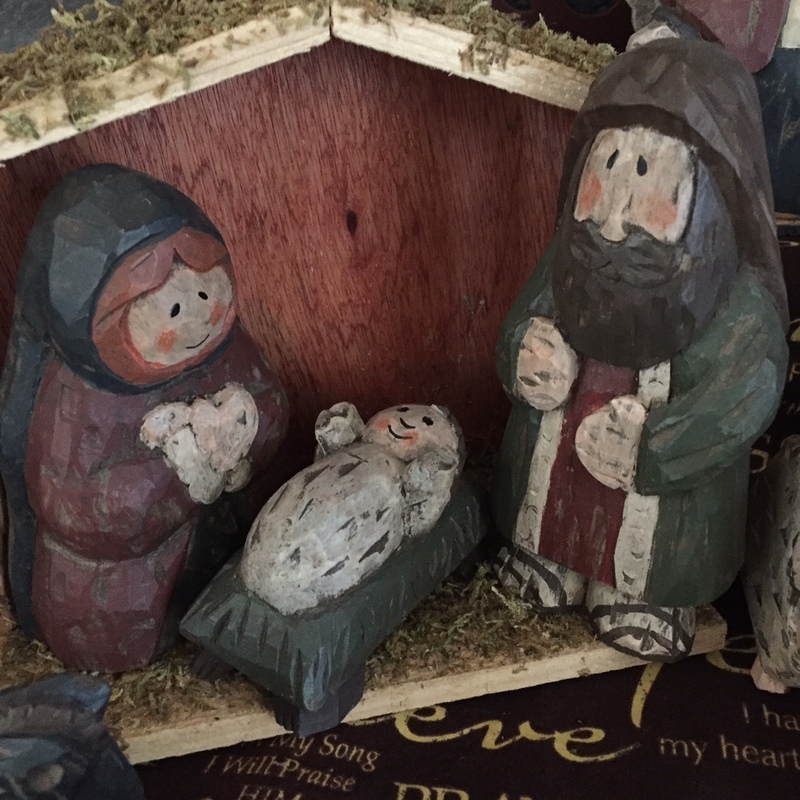 Our family nativity is my all-time favorite and I love to share the story about how we acquired such a unique set. I also love visiting the homes of family and friends and seeing their nativity displays. Most times it leads to another wonderful story as well. Cookie Baking I am probably guilty of too much cookie baking during this time of the year, but I love it!!! I wish we could live off Christmas cookies, but I’m afraid of what we might look like if I got my wish. Too many favorite cookies to name, I especially love making treats to give away to family and friends. Holiday Movies The Christmas season would not be complete without holiday movies. My all time favorite is It’s a Wonderful Life. Watching the Charlie Brown Christmas is a must. I also like to sprinkle in a little Christmas with the Kranks, National Lampoon’s Christmas Vacation, A Christmas Story and Elf among others. Christmas Cards I love the tradition of Christmas Cards, but I’ve noticed that this tradition is fading. Sigh. As someone who has lived in several states and many cities (towns) over the years, this is one of the best ways I know of to catch up with far away friends and family. Be sure to throw in a zany family photo or funny Christmas letter! Christmas Lights Tour This is a tradition that goes way, way back for me. I can remember piling up in the car as a child and checking out the Christmas lights in my little hometown. Today, my husband and I continue to take (drag) our children out to look at the lights. This year we cranked our adventure up a notch with a Holiday Lights Scavenger Hunt. Great fun! Snow Never a guarantee, but snow really makes it all perfect. It seems that whenever it snows the world seems to slow down a bit…offering us a moment to take in and savor everything around us. The holidays typically fly by…I need a little snow to take it all in. 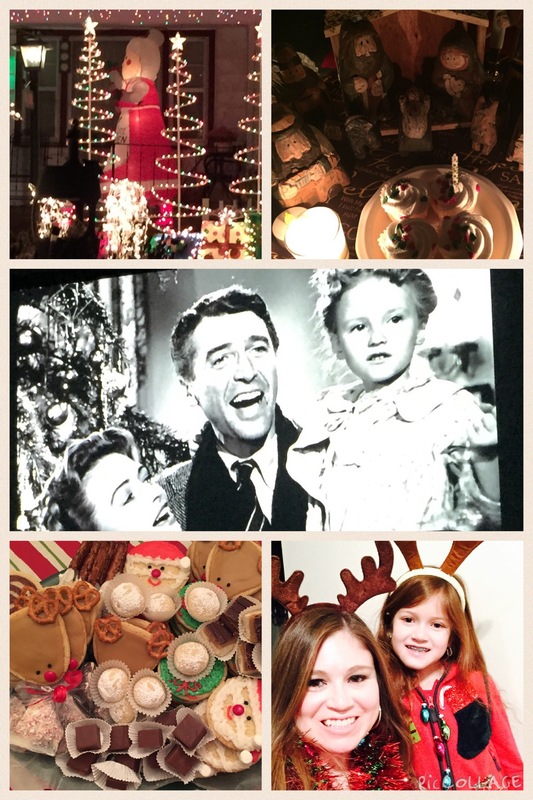 A few honorable mentions to my list: cocoa, caroling and Christmas parades! They don’t call it the most wonderful time of the year for nothing. Wishing you the Merriest Christmas! The Holy Spirit spoke to me while putting away Christmas decorations last year. “Leave this one out,” it urged, “Place it some place where you will see it. Leave it some where so you won’t forget.” This Divine nudge prompted me to leave the Dollar Store Jesus on the shelf in the dining room. At first, it felt odd. Really odd. Not a lick of glittery, sparkly Christmas décor around and there sat the clumsily painted baby Jesus. A gift to my son from several years back. A tradition really, as I always try to purchase a little something for the kiddos to remind them of the true Reason for the season. Mostly I buy ornaments, but when the children were very young I wanted them to have a “hands on” experience with Jesus. The Dollar Store is perfect for gifts like this…it was a cost-effective way to teach the children to be careful with breakables while allowing them to touch, feel, and hold an item so precious. If it broke, no problem. We would carefully glue it back together or (as is prone to happen with little boys) we would sweep up the pieces. I wanted them to know that Jesus was always within reach and as a result various Dollar Store Jesus figurines would live among other toys, on their bedroom night stands or carried in a backpack to preschool show-and-tell…all December long. The collection grew larger each year with a few duplicates after Casey was born (whatever Sean had, Casey had to have, too) and then back in the box they would go. Until now…. Over the past year, this Dollar Store Jesus has lived among various other holiday decorations, next to the kiddos’ photographs, by the clock, near the plants, and on the piano. I laugh to myself every time I place Him in a new “home.” Will anyone notice? (They did.) Will anyone care? (This is yet to be determined.) Regardless, I know He’s there…reminding me. EVERY DAY JESUS. I’m just CRAZY about Christmas! I always have been. And somehow, I have managed to let both the secular and the sacred share space in my heart (with the tie going to the sacred, of course!) during this magical time of year. As a kid, I remember Christmas Eve worship and how I especially loved the nativity at my Mom’s house. I can recall that it was tucked away each year in its original box, every piece finding its place in the foam packaging. 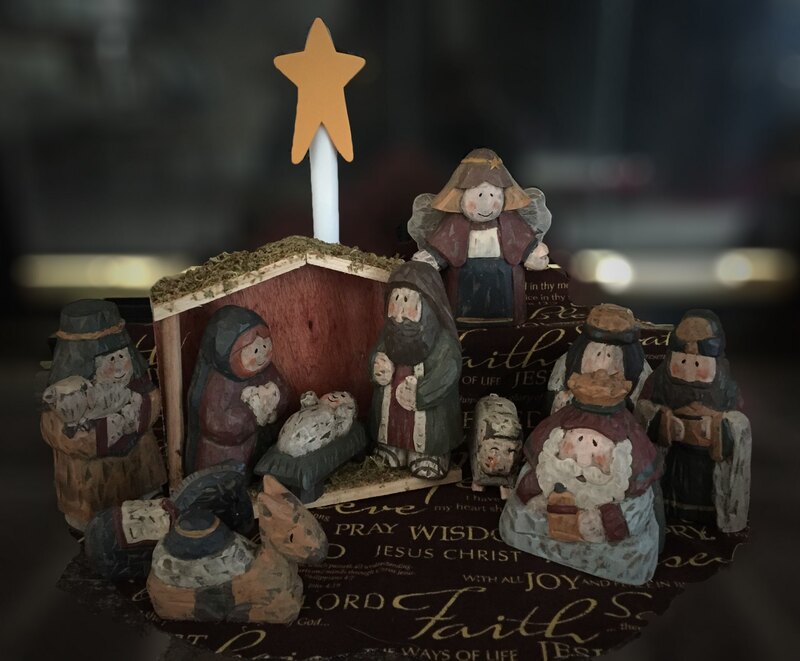 When my mother set it out…baby Jesus, Joseph, Mary and the gang all hung out in a miniature stable that my grandpa made. Examining each piece, I can still see the beautiful face of Mary and the baby Jesus…surrounded by hay…looking so heavenly and angelic. Both a baby and a Savior. The little set symbolizing an extraordinary and miraculous moment in time. Joseph looking so noble…the epitome of honor and faithfulness. There were farm animals, an angel, a shepherd boy, and the three wise men, of course. It was pretty wonderful. After moving halfway across the country from California to Kansas, my mother-in-law, Sean and I found ourselves in the Hobby Lobby in Salina…for what I remember was a brief and snack-filled trip to do a little Christmas shopping (by the way, Cheez-Its make for great toddler payola…just saying!) Strolling through a craft warehouse with a 1 year old BOY is no easy task! So when it looked like Sean was going to leap out of the cart at any moment, Karen suggested that Sean help us pick out a nativity for our home. This was a genius idea because it gave my toddler a sense of purpose and I was just thrilled with the thought of having a nativity of my own. In record time, my excitement turned to worry as I remembered that something as fragile as a porcelain nativity probably wouldn’t last but a second in our house. Sean was just so hands-on about everything! In the back of my mind I had planned to buy him a Fisher Price Little People nativity set for Christmas. It was important to me that he understand the Christmas story…and at an age appropriate level. He already had a few Little People collections…the train set and the airport. Still, it couldn’t hurt to look at the nativities on display at the store. It was pretty amazing…an entire aisle with nativities in every shape and size imaginable. My thoughts were racing…where would we put such a fragile item? Karen must have heard the wheels grinding in my head. 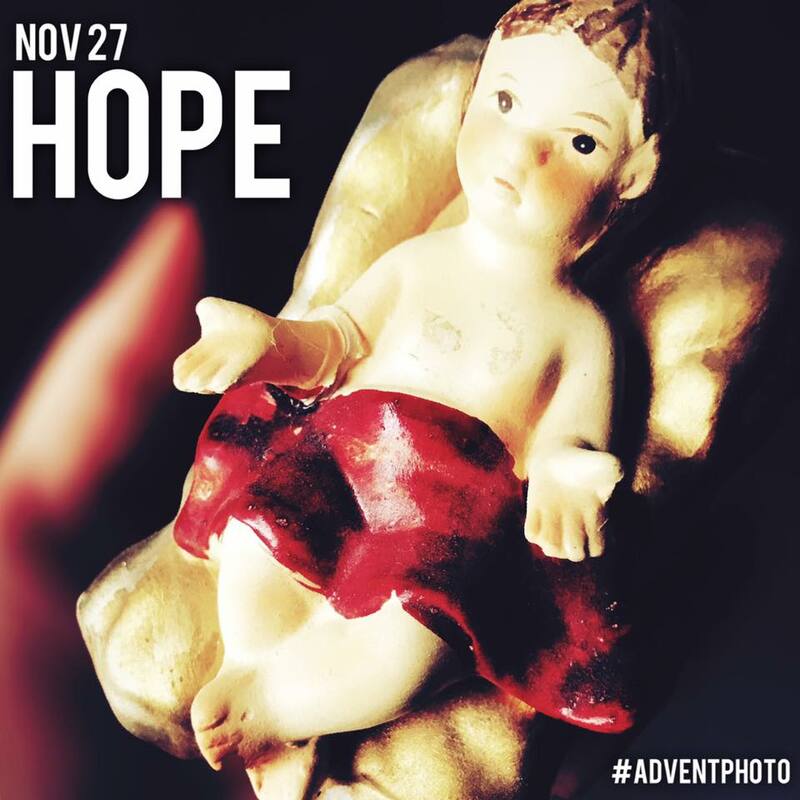 After explaining my thoughts, she said, “Sean will pick out the one that he likes best…and we will teach him to care for it and look after it.” My heart was touched as I watched her talk with Sean about picking out a baby Jesus to take to his house. She reminded him that he would have to take extra special care of it! And asked him if he was ready to choose one. Sean beamed! From an early age, Sean could tell a story with his eyebrows (a talent he inherited from Grandma Karen.) One second the eyebrows would be arched high as he caught a glimpse of something intriguing. The next minute the eyebrows would be furrowed as he inspected his options. Sometimes just one eyebrow would lift as if he was thinking really hard. It was a wonderful little dance. When he finally picked one, all three of us knew this was the nativity for us. It was perfect. A chunky little wooden nativity…not too big and not too small. Sean touched each piece and seemed very delighted with the farm animals in this set. Since all the nativities were technically “on display” we found a store worker who immediately set out to find us a boxed set from the storage room. However, when she came back, she wasn’t carrying a box. Uh-oh. She explained that they hadn’t ordered many of this set and that they were sold out. She had also checked to see if getting one before Christmas was a possibility. It was not. Karen is always cool as a cucumber in these sorts of situations. Clearly, THIS was the set that Sean wanted. She didn’t want to disappoint her grandson so she did what ANY grandmother would do. She asked if we could buy this very set. The store worker said that in any other situation she would love to sell it to us, except that this set had been GLUED to the foam board it rested upon. She pulled off one of the wise men to demonstrate. Stuck to his base was loads of navy blue paper and foam. Both Karen and the worker tried to pull it off. It was no easy task. Even if we pulled each piece from the board we would then have to pull off loads of paper scraps. 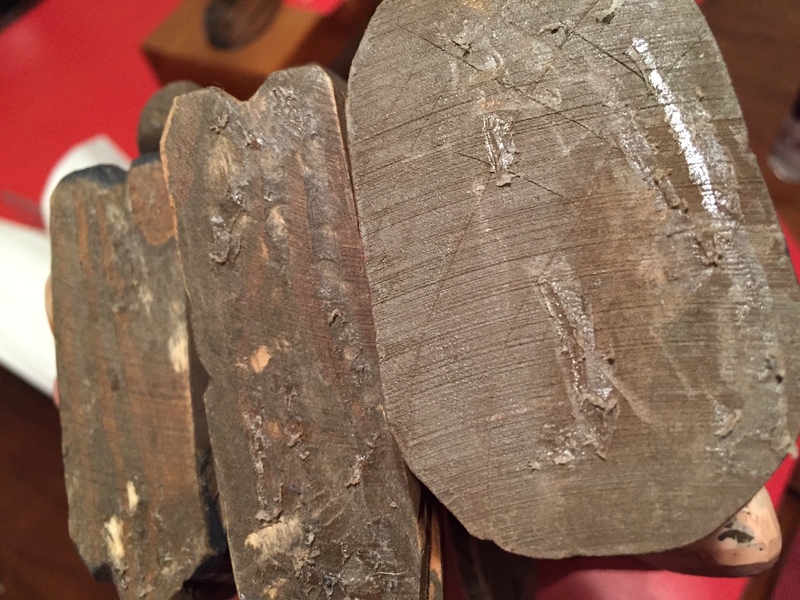 The lady said that the pieces might not even stand correctly given the amount of glue left on the base. She obviously didn’t know who she was dealing with…Karen said she would work all that out later if we could just buy this nativity set. And so, it was settled. Sean held the wise man in his hot little hands as we arranged the foam board and the glued down pieces across the shopping cart basket. There were quite a few stares, but we managed to check out and make it to the car. From the moment we got home Karen worked on releasing each character from the foam…carefully pulling off paper and glue. Her beautifully manicured nails probably got the raw end of the deal that day as she scraped and scraped. Each time she finished a piece she handed it to Sean. His eyebrows went to work again…doing their little dance as he checked out each one. He would show it to me and then go and show his Dad and then show me again. I think Sean had already had a bath and was tucked into bed before Karen had finished them all. It was truly a labor of love. Sean played with the nativity all December long. Each day he would rearrange them and make sure the animals were “fed.” Since our set didn’t come in a box, we lovingly packed them away in an oversized shoe box after the holidays, unpacking them with great delight the next year and the year after that. Sean never seemed to tire of “playing” with the set. When Casey came along (and was old enough to follow her brother everywhere,) he explained the cast of characters to her. “This is baby Jesus…His mom’s name is Mary and His dad’s name is Joseph…,” and on down the line. These are the moments that live in a mother’s heart for eternity. Today, the nativity makes its home in front of the fireplace each Christmas and it serves as the centerpiece of our Christmas Eve dinner table. I still love taking it out of the shoe box each and every year…a flood of memories spilling out with each “sticky” piece. You know the Christmas trees you see at the store? The pretty ones that they put in the windows and on display for everyone to gawk at and fawn over. The perfect ones that force you to stop in your tracks and make your mind ponder (just for a moment) if perhaps you’re really ready for a “grown-up” tree. The kind of tree that screams I have style AND taste. Yeah, I’ve seen those trees, too…. 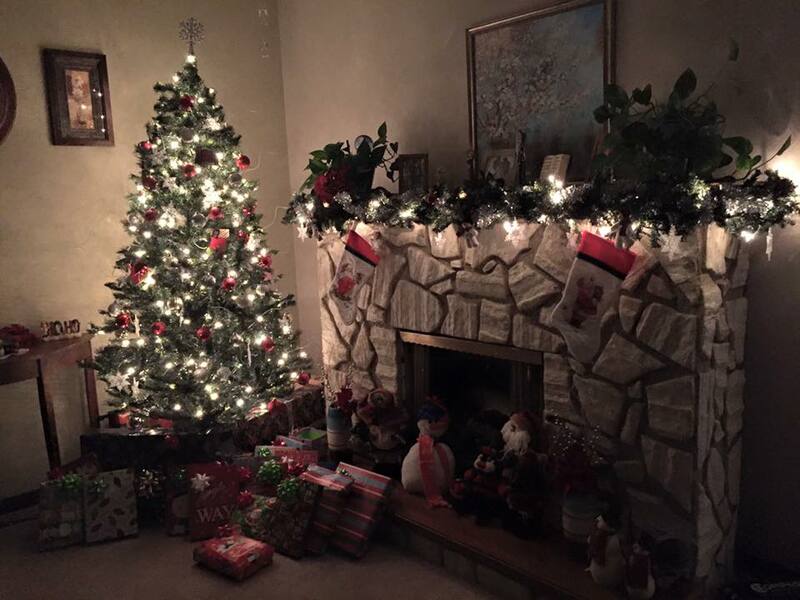 My Mom’s Christmas tree display 2015. Lately, I’ve seen a lot of them. Not just at the stores, but on Facebook, Instagram, Pinterest (the social media list goes on and on) and even in the homes of family members and friends. It seems to me that everyone has one of these beautifully accessorized trees. And this sort of thing stands out to me, not because I’m envious or jealous but more from a place of sheer admiration. You see, I LOVE Christmas trees…all kinds (and especially the Charlie Brown one,) but in my heart of hearts I always imagined that I, too, would have one of these special Christmas trees…a “magazine ready,” picture perfect tree. My Mom has that kind of Christmas tree. I can remember the red apple tree, the blue and silver bulb tree, and the crystal snowflake tree, among others. I always assumed that would be my destiny–like mother, like daughter. In fact, I tried really hard to have one many moons ago. 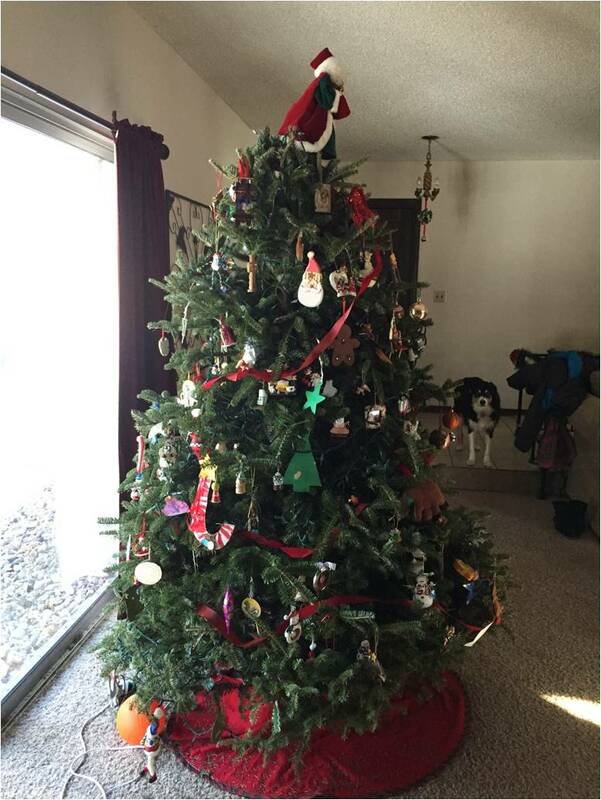 When I met my husband he had a Christmas tree in his living room…in May. Granted it was a mini TV top tree, but he had it on display for Memorial Day, I guess (oh, and a plush Thanksgiving turkey was placed next to it, too, probably to welcome the summer season.) I took this as a sign that he wasn’t much into decorating and eventually I filed it away as proof that I would be in charge of all holiday décor. So when we graduated from tiny, dorm apartment living and moved to a home in Salina, I figured this was my big break. I was going to do Christmas my way. I remember telling my Mom that I was going for a blue/white/silver snowman theme. She purchased ornaments to get me started and I began to gather all the “right” accessories as well. 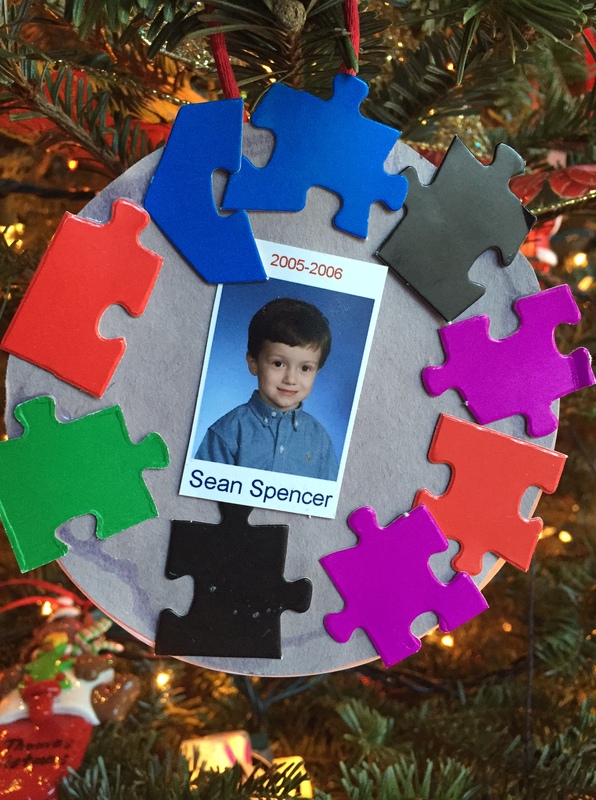 Our son, Sean, was just over a year old, and after photos with Santa one night, we came home to decorate the tree. And while I was strategizing and putting a final game plan together, Steve and Sean were already placing ornaments on the tree. What? Turns out these ornaments were from Steve’s childhood along with a few others that his mother had passed down to us. (I’m still not sure where this box came from.) Sean looked thrilled as several of these ornaments were football related. And I remember stopping in my tracks and thinking that 49er red really didn’t go with my snowman theme…at all. Obviously, a “discussion” ensued. That Christmas the tree was properly adorned with blue/white/silver snowman themed items and EVERY ornament my husband had ever owned in his life. I figured I had lost the battle, but certainly not the war. There was always next year, and the year after that, and the one after that. The odds, however, were not in my favor. Please don’t feel bad for me. It really wasn’t a make or break deal. I love Christmas and pretty much all things Christmas related. So we moved on and it wasn’t until Sean was in preschool that I finally got on board with the “all-things, everything” kind of Christmas tree. When that sweet-faced little boy brought me his first homemade ornament from school and proceeded to put it on the tree…well, my heart melted. He was so proud of himself. A little man contributing to a holiday that I loved so much. Sean would tell me in his tiny voice, “I made it for you.” So naturally every scribbled on, wadded up, half-glued, misshapen ornament made its way onto the tree–as it should. And when Casey came along, well her “contributions” went up right along side his. As you can imagine, after more than a decade of “contributions” amassed from school AND church, we now have quite a collection going. Add to it EVERY ornament we have ever received from relatives, friends, plus our church family, and it amounts to 7 boxes of Christmas knickknack goodies. Every year the tree is quite full (this may be an important factor when you consider the number of times the tree has fallen over the years,) but I wouldn’t have it any other way. The Spencer Family Christmas tree is full of as many stories and memories as it is ornaments. This year the kids asked me if we really had to hang every last trinket from the boxes. I guess they thought that maybe the “bead ornament” (there really is no other name for it since it resembles absolutely NOTHING ever known to man) and the “paper Jesus candy cane” may have seen better days. “If there’s room on the tree, then there’s room for it,” was my constant reply. And while I think the “all-things, everything” kind of Christmas tree has roots in my husband’s Christmas tradition, he is the one who announces every year that “it looks like Christmas threw up in here!” At least he says it with a smile. Our tree is still up (it’s New Year’s Day,) it’s leaning to the side as is its custom during the 12 Days of Christmas, and the ornaments are taking themselves down (with a mini thud!) The Christmas “spew” extends well beyond the tree to the fireplace mantel, hearth, the piano and into the dining room, and it will…for at least another week. Yes, it STILL looks like Christmas in here and everywhere we go…even if it’s the regurgitated type. Falalalala Lalalala! Sometimes I think that we open some of our very best Christmas presents long before the big day arrives. For me, there’s something special about unpacking all the Christmas décor, ornaments, and trinkets that I’ve collected through the years. Every December we lug the boxes upstairs and like little kids open each with a sense of excitement–kind of like running in to an old friend or finding something that was once lost. My kids (even as a tween and teen) exclaim, “Remember this!” Or they’ll question me, “Why did you save that?” and “How long has this been in the family?” One of the things that touches my heart most are the tales behind these treasured keepsakes which leads me to my favorite comment, “Tell me the story about this one!” Then I get to share the story behind baby ornaments, school crafts from days gone by, or the Hallmark Yoda figurine that adorns the tree every year. It was actually this ornament (and all the hub bub about the recently released Star Wars movie) that led me to write this post as I chronicle three of my favorite Spencer Family Christmas stories. Casey wearing one of THOSE Christmas aprons before cookie baking in 2012. Let me begin with the FACT that my mother-in-law is far more popular than I could ever hope to be. I think even complete strangers would nominate her homecoming queen should we ever find ourselves in high school again (despite the fact that we graduated in different decades and states!) From hello, people just love her. Actually, you don’t even have to speak to her to like her…I’ve witnessed countless strangers ask her for directions, information, and just start chatting with her without any prompting whatsoever. She just has one of those faces that says, “Let’s be lifelong friends.” It’s a rare gift (my husband has the same one,) and I just can’t help but sit back and marvel. This sort of thing comes in handy when you shop at Hobby Lobby…or at least that’s what I’ve concluded whenever Karen is around. And Hobby Lobby is the scene for this Christmas memory. 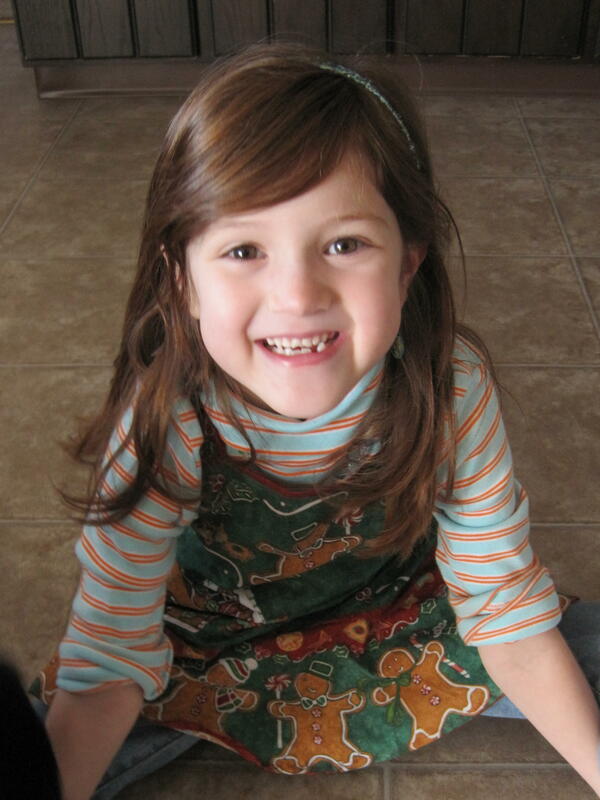 My daughter Casey was just a little, bitty thing at the time…probably 3 or 4ish. She didn’t mind sitting in shopping carts especially if grandma was “driving.” While I can’t recall why we went into Hobby Lobby that day (although I don’t think one has to have a specific reason for going into Hobby Lobby because who doesn’t LOVE that store?) There we were in the fabric section when my mother-in-law spotted these cute, matching, mother/daughter gingerbread aprons. Displayed on mannequins for all to see, they were just perfect for Casey and I. Karen pointed them out to me…suggesting that we really needed to have THOSE Christmas aprons. I agreed, but didn’t think much of it because the Christmas apron pattern was situated in such a way as to suggest that you had to make the aprons yourself (this is a craft store after all.) I believe Karen’s response was, “Nonsense,” as she took them off the mannequin and put them in the cart. We continued our shopping and eventually landed at the check out. I have to admit that it was pretty funny watching the cashier search the aprons for the price tag, but what was even better was the look on her face when Karen explained how she got the aprons. I imagine that it’s a pretty rare occurrence when someone takes a sample product off a mannequin and then proceeds to try to purchase it. The cashier explained that sample items are not for sale…they are SAMPLE items. Karen wasn’t deterred in the least. She asked the cashier to get someone from the fabric section to come to the check out stand so we could discuss the purchase of THOSE aprons further. I’m pretty sure at this point we were holding up the check out line, but still we waited. Finally, someone came up. She agreed with the cashier that the aprons were samples and not for sale which led to a conversation about what actually happens to the samples at Hobby Lobby when they are no longer needed. It was interesting…typically the items are returned to the person who made them, stowed away for display at a later date, or just given away to someone who works at the store. Karen reiterated that she would like to purchase them as a Christmas gift for me and my daughter…telling about her visit to Kansas from California, my love for baking, and Casey’s fondness for Rachael Ray (but that’s another blog.) Clearly, Karen had won over the woman from the sewing department and a few seconds later we were exchanging phone numbers and my mother-in-law had arranged for the store to call me (after Christmas) to pick up the aprons when they were no longer needed. They agreed the aprons could be purchased for $5 each and all I had to do was keep a hold of this little piece of paper until the pick up date arrived. SCORE! 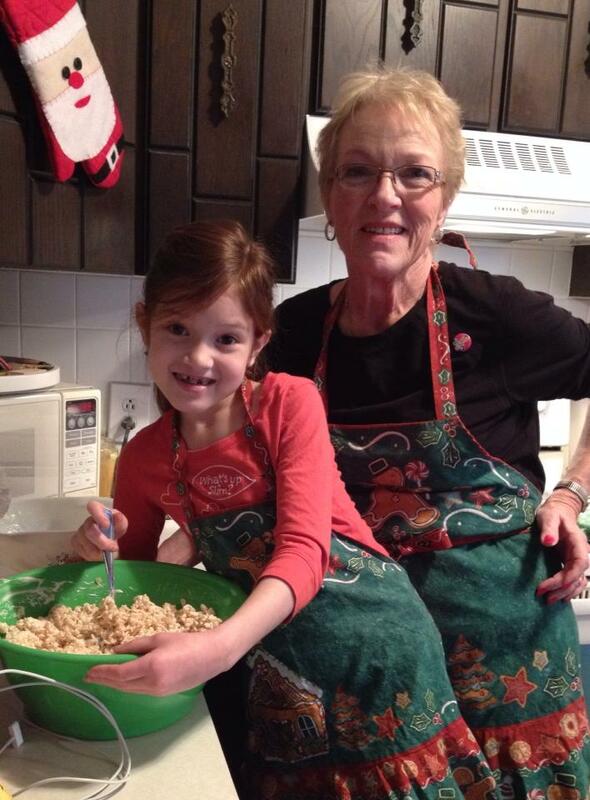 Grandma Karen and Casey wearing THOSE Christmas aprons while making holiday rice krispy treats! In the back of my mind, I wondered if they would really call. I mean, Karen had already returned to California, no money had changed hands at that point, and the note from the store (scrawled on the back of a receipt) hardly seemed like a binding contract. Yet, there it was…a few days after Christmas…a message on the phone from Hobby Lobby saying that I could come and pick up the aprons from the sewing counter in the store. Well, Casey and I hot-footed it over there and sure enough, THOSE Christmas aprons were right there waiting. They were even cuter than I remembered and Casey was so excited! We proceeded to the check out full of smiles…and then…. The cashier (the same one from our previous visit to the store with Karen,) looked at the aprons and frowned. FROWNED. She looked at me said, “You can’t have these.” I was taken aback as she explained that she couldn’t possibly sell these aprons to me because the sweetest woman from California had come to the store before Christmas and she wanted to buy them for her granddaughter and daughter-in-law. She repeated the whole encounter to me and I couldn’t help but laugh…which threw her off a bit. I pulled out the little note and told her that I was with Karen that day. I wish I could have captured her smile! She was so delighted that we were going to have THOSE aprons after all! She said she remembered my mother-in-law very well and although she didn’t recognize me (surprise?) she didn’t think she had the heart to sell them to anybody else after meeting Karen that December day. Karen had used her “gift” to secure a truly, special gift for Casey and I. Every year at Christmas time we pull THOSE aprons out–our cookie baking wouldn’t be the same without them! This year when Casey put hers on we realized just how tiny the apron really is. Casey is 10 now and while the apron still fits it’s clear to see that she’s not a preschooler any more, but that same sweet smile spreads across her face when she wears it. THOSE Christmas aprons have become a part of our family’s Christmas tradition and I love to tell the story. THE Christmas tree: Symbol of that oh so special holiday, proudly displayed each and every year in a place of prominence, carefully adorned with treasured and sentimental ornaments. A recognized hallmark of the Christmas season and the BANE of my Decembers. As our family always opts for the “real” variety (instead of the plastic trees of my childhood,) it seems that somewhere along the way a war has been waged between the Spencer family and THE tree. A battle that never fails to entertain and frustrate at the same time. This year proved no different. 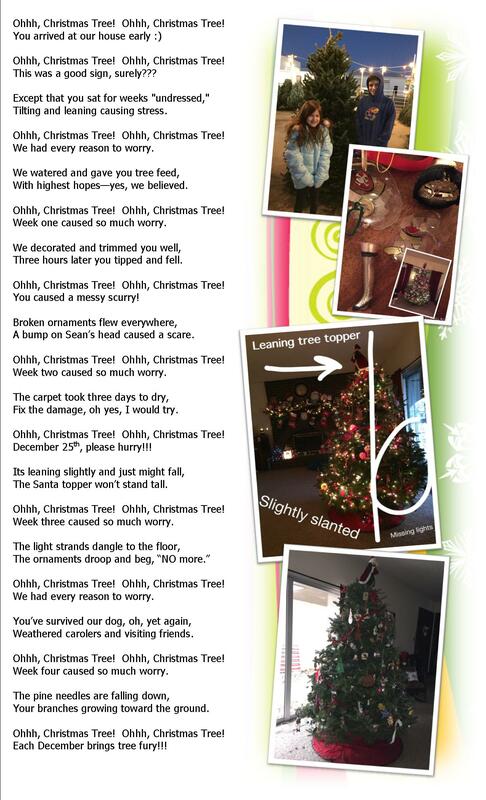 So may I present to you our annual Christmas tree adventure–in song form! Oh yes, this year’s tree had us fooled…we REALLY thought this was THE perfect tree 🙂 Each family member convinced that we could avoid the typical end of the year evergreen hijinks. Fools we were, this tree had our number from Day 1. THE tree on January 4, 2015. A little scraggly, still standing!